When it comes to social skills, learning how to communicate effectively is of utmost importance. It doesn’t matter how brilliant you are; if you don’t know how to convey your ideas, you won’t get far. Good communicators are the most successful people in our society; they enjoy life more, perform better academically, and make more money at work. 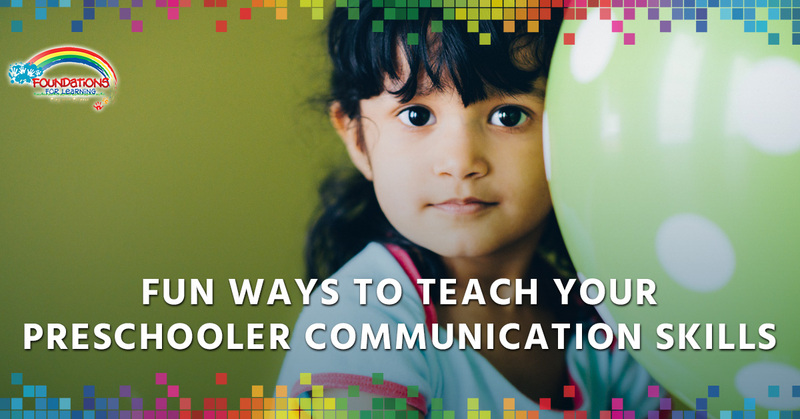 To set your child up for a successful life, it’s important to teach them communication skills from a young age. Of course, for preschoolers, teaching any skill needs to be fun to hold their attention. Fortunately, at Foundations for Learning, we’re used to making learning fun! In this blog, we have compiled a list of fun activities you can do with your child to enhance their communication skills. You played this hilarious game in elementary school, and now you can pass it on to your child. If you don’t remember how to play or somehow didn’t actually play this fun game, here’s how you play: one person whispers a message in the ear of another person, who then repeats that message to another, who then continues to pass the message down the line. At the end of the line, the last person tells the group what they heard. Most of the time, the original sentiment has become so lost in translation, what is said at the end is really silly. Your child will love this funny game, and it will enhance their listening skills. In this game, show your child a picture from a magazine or book. Then, ask them to tell you the story of what’s happening in the picture. Make sure they know there isn’t a right or wrong answer; they should just use their imagination! If they are younger or more shy, you can start the story off for them first and then ask them how they think the story should end. This allows your child to learn to improvise in conversation. Create note cards with different emotions on them, using pictures of facial expressions to convey the feeling. You can hang these cards on a wall or just somewhere your child can reach. Then, make a point to check in with how your child feels a couple of times a day and ask them to pick which card best describes how they feel.This game is not only beneficial for communication skills, it also helps children with emotional regulation. As they learn to identify their feelings, they are better able to manage them. Do you have a chatterbox in your household? This is a good sign for being able to speak well, but it’s important that your child also learns how to actively listen. To address this issue, make a “conversation ball,” a ball that you use during discussions that serves as a microphone. When someone else has the conversation ball, your job is to listen, not speak. Once the person is done, they hand the ball to the next person for their turn to talk. At Foundations for Learning, we are proud to help your child develop the communication skills they need in order to thrive. When you’re looking for a day care in South Windsor, contact us!